For 18 years David Alton was a Member of the House of Commons and today is an Independent Crossbench Life Peer. He began his career as a teacher and, in 1972, while still a student, he was elected to Liverpool City Council as Britain’s youngest City Councillor. In 1979 he became the youngest member of the House of Commons and, in 1997, and when he stood down from the Commons, he was appointed a Life Peer. His motto on his Coat of Arms is taken from the Book of Deuteronomy: Choose Life. London, UK, 1951 of British and Irish parents. Holds British and Irish citizenship. Edmund Campion School, Essex; Christ College Liverpool (achieved academic distinctions); St. Andrews University, Scotland (fellowship): Professor of Citizenship, Liverpool John Moores University (1997-2016); Hon.Professor at Yanbian University, China. Visiting Professor Liverpool Hope University. Married to Elizabeth Bell, with four children and three grandchildren. Resident in Lancashire, UK. Qualified as a teacher in 1972, working in socially disadvantaged neighbourhoods, teaching immigrant children and later children with special needs. He became involved in politics as a teenager and at 17 years of age was elected as chairman of his town’s branch of Young Liberals. In his Student Union he successfully proposed a campaign against apartheid and became active in community politics, choosing to live in a neighbourhood where half the homes had no inside sanitation and had been designated as a slum clearance area. While still a student, aged 21, in 1972 he was elected to Liverpool City Council for the Low Hill (and Smithdown from 1973) Ward and became the city’s Housing Chairman and Deputy Leader. David Alton was elected as Member of Parliament for Liverpool Edge Hill at a by-election in 1979 for the former Liberal Party (the party of Gladstone:https://davidalton.net/2012/02/18/gladstone-lecture-liverpool-son-of-liverpool-scourge-of-tyrants/ ), when he became the “Baby of the House” – the youngest member – achieving a record swing of 36.8% and 64% of the vote. He was his Party’s spokesman on Home Affairs, Northern Ireland, Overseas Development and the Environment, and served as Chief Whip, Chairman of the Party’s Policy Committee and national President of the National League of Young Liberals. From 1979 to 1988 he served at various times as spokesman on the environment, overseas aid,home affairs, Northern Ireland and as Chief Whip. He was Chairman of his party’s Policy Committee and its Candidates Committee. He is known for his strongly pro-life position on abortion, and in 1987 he resigned as Chief Whip to campaign for his unsuccessful private member’s bill which aimed to stop late abortions. The Bill achieved a record 296 votes and a majority of 45 in the House of Commons – and never lost a vote at any stage – but was filibustered by opponents. He served on the House of Commons Privileges Committee and was one of the MPs asked to investigate the Cash for Questions scandal. In 1990, with Ken Hargreaves MP, he co-founded the nonpartisan Movement for Christian Democracy which emerged from the Epiphany Group which he had convened the previous year. It published its Westminster Declaration based on six principles: social justice, respect for life, active compassion, empowerment and good stewardship. In 1992, after his Party moved from a “conscience” position on abortion to making the issue a matter of party policy (on the same day on which a motion was passed calling, among other things, for protection of goldfish sold in amusement arcades and funfairs) he announced that he would not contest again on the party’s platform. In 1997 he stood down from the House of Commons, and from party politics, and was nominated by the Prime Minister, Sir John Major, to the House of Lords, where he sits as an Independent Life Peer, speaking regularly on human rights and religious liberty issues. He was one of the six MPs who first called for the televised broadcasting of Parliament; one of the officers of the parliamentary committee that opposed anti-personnel land mines; one of the six signatories of the Motion that challenged the safety of the convictions of the Birmingham Six and Guildford Four; and one of the four Peers who moved the “Dubs amendment” to provide sanctuary in the UK for unaccompanied refugee children. He has introduced Private Members Bills in Parliament on the rights of private tenants; minimum housing standards; victims of violent crime; the upper time limit for abortion; the right to establish housing co-operatives; the right to establish directly elected neighbourhood councils; the re-export of arms; a Bill to require research into the causes and cures for mesothelioma; and a Bill to create new mechanisms to bring to justice those responsible for genocide or crimes against humanity. 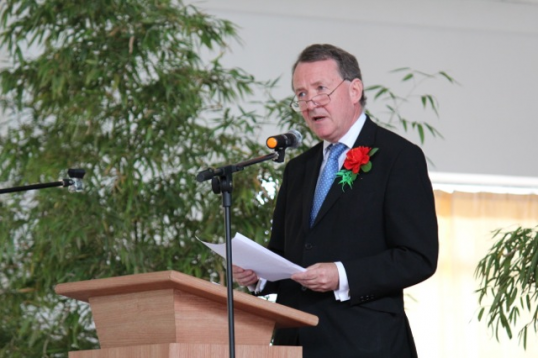 Lord Alton is Founder and co-chairman of the British-DPRK All-Party Parliamentary Group, and visited Pyongyang on four occasions, including in October 2010 when he had talks with leaders of the North Korean government including Choe Thae Bok, chairman of the Supreme People’s Assembly, the country’s rubber-stamp parliament and when he protested about human rights violations in that country, raising specific cases with their Ministers. He details his experiences in his book, written with Rob Chidley,”Bulding Bridges: Is there Hope For North Korea?” (Lion 2013) one of eleven books he has authored. He also successfully campaigned for the creation of BBC World Service broadcasts to the Korean Peninsula. In 1987, with Danny Smith, he launched the human rights group, Jubilee Campaign, which led to campaigns, visits and reports on the plight of Jewish and Christian dissidents in the former Soviet Union and Eastern Europe: http://www.jubileecampaign.co.uk/ On several occasions had trees planted in his name in Israel in recognition of his work for Soviet Jews. Throughout the 1990s, and subsequently, he has continued his campaigns for human rights and the sanctity of human life. Lord Alton campaigned against the Human Fertilisation and Embryology Act 2008, opposing the creation and use of animal human hybrid stem cells for medical purposes and in Parliament has spoken against designer babies, gender and eugenic abortions, and euthanasia. In 2008, he spoke out against the British Olympic Association when it forced athletes to sign an agreement forbidding them from criticising China’s human rights record before or during the 2008 Summer Olympics. and has been a leading opponent of China’s one-child coercive abortion policy, successfully campaigning for Chen Guang Chen, the blind Chinese human rights activist, imprisoned for four years for opposing the policy, to leave China. Lord Alton presented him with the Westminster Award for Human Rights, Human Life and Human Dignity at Parliament. In 2018 and 2019 he has raised the plight of Chinese Muslim Uighurs and the coercive harvesting of organs in China. In Parliament, he is co-Chairman of the All Party Groups on North Korea and Pakistan Minorities. He is Secretary and a past Chairman of the All Party Group on Sudan and South Sudan, visited the South during the civil war and visited Darfur. He has regularly highlighted the atrocities committed there, including a 2016 letter to The Times about the alleged use of chemical weapons in Darfur. He serves as Vice Chairman of the All Party Groups on Egypt, Tibet, Eritrea, Haiti, and Uganda and the All-Party Parliamentary Group on Democracy in Burma; and is Vice Chair of the All-Party Parliamentary Group on Hormone Pregnancy Tests which was established to investigate and highlight the use of the drug ‘Primodos’. He was a Founder of the All Party Group on Freedom of Religion or Belief. He is a Patron of the London-based rights group Save the Congo! In 2015 he visited a detention centre in South East Asia where fleeing Pakistani Christians and Ahmadis are being held; subsequently chaired an in Inquiry into their fate; and in 2018 undertook a fact finding human rights visit to Pakistan. During 2018 he has also been part of an Inquiry into the treatment of Pakistan’s Ahmadis and spoken on the persecution of Egypt’s Coptic community at a conference in Washington DC. During 2018 he has initiated a debate in the House of Lords about the increasing level of violence in Nigeria and secured a further debate on the ineffectual response to genocide. 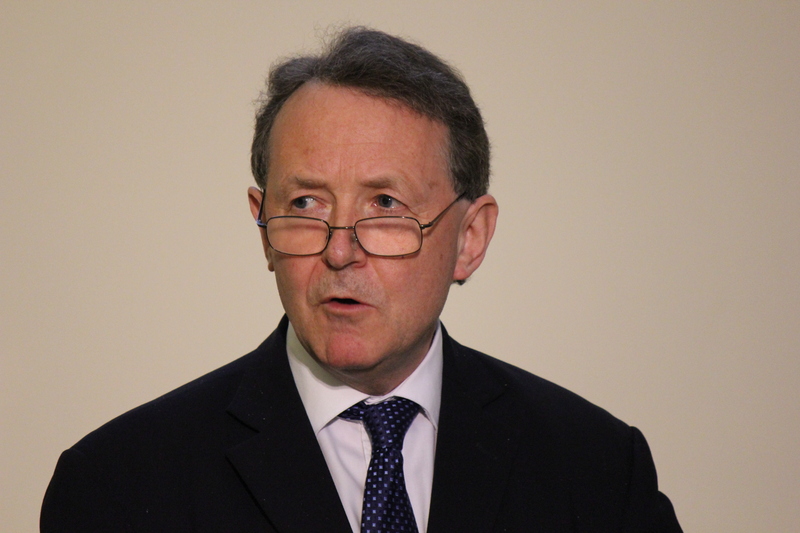 In 2018 he also chaired a hearing on Eritrean religious minorities and refugees and subsequently opened an exhibition on Eritrea in London; he launched a campaign and published a letter in The Times opposing the use of Chinese corpses in an exhibition; he visited Pakistan and raised human rights cases and visited slum areas which are home to the country’s persecuted minorities. In November 2018 he visited Pakistan, travelling to Lahore and Islamabad, and raised the case of Asia Bibi the plight of minorities. In Washington he spoke at a meeting in Congress about the persecution of Copts and in New York at a Summit on the infringements to Article 18 of the Universal Declaration of Human Rights. In 1997 he was appointed as Professor of Citizenship at Liverpool John Moores University and established the hugely successful Roscoe Foundation for Citizenship: http://www.ljmu.ac.uk/roscoe/ He retired from this role in 2016. The Roscoe Lectures became the biggest continuous spoken word events in the UK, with audiences averaging 1000 people. The lecture series explores citizenship and lectures have been given by commentators including the 14th Dalai Lama and Prince Charles. In June 2016 David chaired the last of over 140 Roscoe Lectures and after twenty years he retired as Professor of Citizenship. In July 2016 he was made a Fellow of Liverpool John Moores University . In 2017 he was appointed as a Visiting Professor at Liverpool Hope University with a mandate to examine the causes of conflict and their resolution. In 1987 he published “What Kind of Country?” – the first of eleven books. Building Bridges – Is there hope for North Korea? (with Rob Chidley). published by Lion, 2013. He has also authored several reports on human rights in countries such as North Korea, Burma, the Democratic Republic of the Congo, Brazil, Sudan/Darfur, Tibet and Rwanda – all of which he has visited. He entered Burma’s Karen State illegally on two occasions and subsequently presented evidence to an American Congressional Committee detailing crimes against humanity. Details of his reports and speeches on human rights and religious liberties are available on this web site. Among the international awards he has received are the Michael Bell Memorial Award for Initiatives for Life, the Korean Mystery of Life Award presented by the Cardinal Archbishop of Seoul , and the Good Samaritan Advocates International Award for human rights work. In 2005 he was created a Knight Commander of the Military Order of Constantine and St. George in recognition of his work for inter-faith and ecumenical dialogue. In 2008 he was made a Knight Commander of the Order of St Gregory in recognition of his work for human rights and religious liberty. In 2012 he was awarded an honorary professorship by China’s Yanbian University of Science and Technology. In 2014 he was given an award for his human rights work by the Coptic community and in 2016 was made an honorary fellow of Liverpool John Moores University for his work on citizenship. Postal address: House of Lords, London SW1A OPW. Last recorded on this site , on March 17, 2005 Mental Capacity Bill Lords. For later contributions (2005-present) visit www.theyworkforyou.com and see http://www.publicwhip.org.uk/mp.php?mpn=Lord_Alton_of_Liverpool&mpc=Lords&house=lords. Information presented on this page was prepared from the XML source files, together with information from the History of Parliament Trust, the work of Leigh Rayment and public sources. The means by which names are recognised means that errors may remain in the data presented. David has never been one to shy away from a challenge – whether as the local councillor for Low Hill and Smithdown, where he was elected while still a student, as the MP for Edge Hill and Mossley Hill – the youngest member of the House of Commons – or as a human rights campaigner speaking on behalf of people in countries such as Burma, Tibet or North Korea – all of which he has visited. Few, let alone David himself, would have predicted that nearly 20 years later the University would have given over 140 lectures to audiences averaging around 1,000 people per event. David named the lecture series after one of his heroes, the 19th century polymath William Roscoe – one of the founders of the small institute which has evolved into this university. Launched in the aftermath of the Toxteth riots, de-industrialisation, huge unemployment and the Militant era, the lectures have helped to promote the need for tolerance, respect, for more co-operative politics, and for people to work together for the good of the city. The lectures have given a platform to industrialists, scientists, Cabinet Ministers, heads of state, football managers, comedians, campaigners and even members of the Royal family, to share their views and join with the people of Liverpool to debate the issues that really matter to the city. 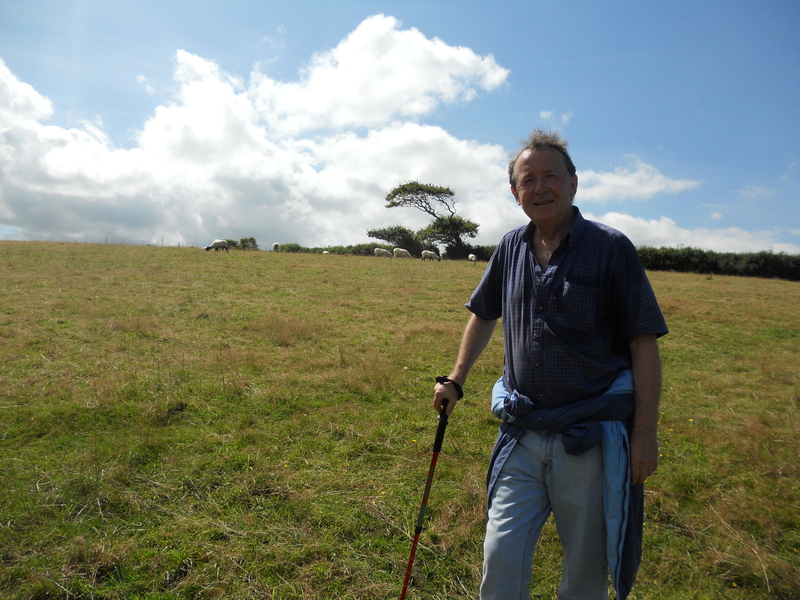 Walking The Saints’ Way, Cornwall, 2012. 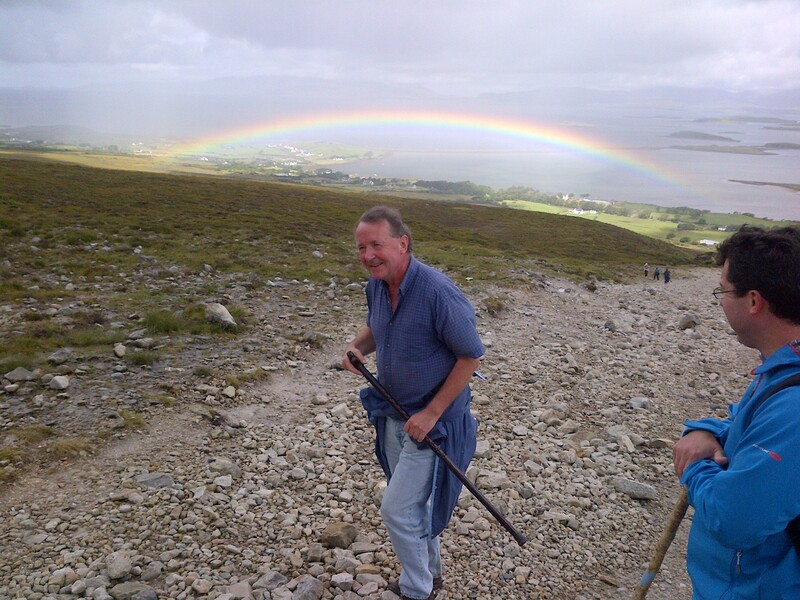 Overlooking Lough Mask from the site of the old Mulroe home in Tourmakeady, Mayo, West of Ireland. 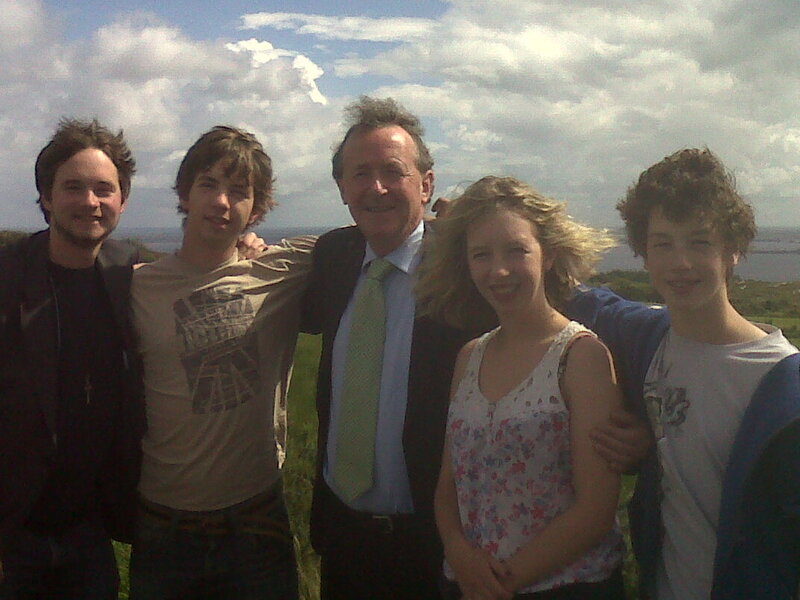 2012 – Philip, Padraig, Marianne and James.